Ephemeris for Friday, April 12th. Today the Sun will be up for 13 hours and 19 minutes, setting at 8:23, and it will rise tomorrow at 7:02. The Moon, at first quarter today, will set at 3:55 tomorrow morning. With international cooperation NASA is hoping it and its partners, the European Space Agency, The Japanese JAXA, The Canadian Space Agency and the Russian Roscosmos will a build the Deep Space Gateway, a way station between the Earth and Moon to exchange crews and vehicles traveling between the two bodies. 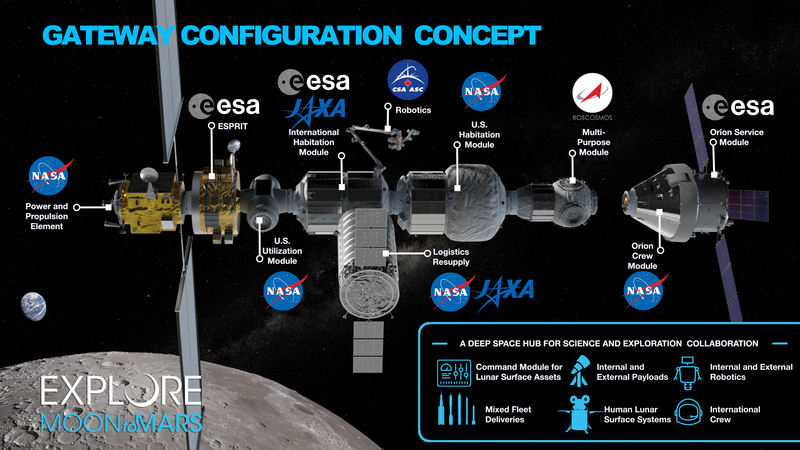 This plan is an integral part of the returning to the Moon by around 2028. The gateway will also be a way station for the eventual exploration of Mars. How President Trump’s new demand to have the United States return to the Moon by the last year of his second term, if he has one, will affect current plans and international cooperation remains to be seen. Deep Space Gateway configuration concept. This would orbit the moon is a long elliptical orbit. Click on the image to enlarge. Credit: NASA. 04/11/2019 – Ephemeris – How far away is the Moon? Ephemeris for Thursday, April 11th. Today the Sun will be up for 13 hours and 16 minutes, setting at 8:22, and it will rise tomorrow at 7:04. The Moon, 1 day before first quarter, will set at 3:02 tomorrow morning. This year, the 50th anniversary of the Apollo 11 first human landing on the Moon, I’ll be talking about some basic facts about the Moon, the Apollo program. The first thing is to realize just how far the Moon is from the Earth. Most diagrams of the Earth and Moon cheat and make them closer than they are. The Greek astronomer Hipparchus in the second century BC got pretty close. The Moon is about 30 times the Earth’s diameter away. If the Earth were represented by a basketball and the Moon by a tennis ball to get their proportional distance correct they would have to be 23 and a half feet (7.16 meters) away from each other, give or take. On average 238,000 miles (383,000 km). It took the Apollo astronauts 3 days cover that distance to get to the Moon. The Earth and Moon to scale. Click on the image to enlarge. Source Wikipedia. At 10 a.m. I found the live feed from the National Science Foundation presenting the results of the Event Horizon Telescope. It was one of four simultaneous presentations around the world at that hour. The buzz beforehand was that they would present the image of the black hole in our galaxy Sagittarius A*. It was not. The image presented was of the black hole in the galaxy M87, some 55 million light years away. It turns out that The black hole in M87 is easier to image. Our black hole appears to be too variable in brightness for this first attempt. The M87 black hole has a mass of 6.5 billion times that of our sun. Our black hole has a mass of about 3 million suns. The size of a black hole’s event horizon is proportional to its mass. So the M87 black hole is about 2,000 times larger than our black hole, but about 2,000 times farther away. So they would appear to be the same size on the sky. 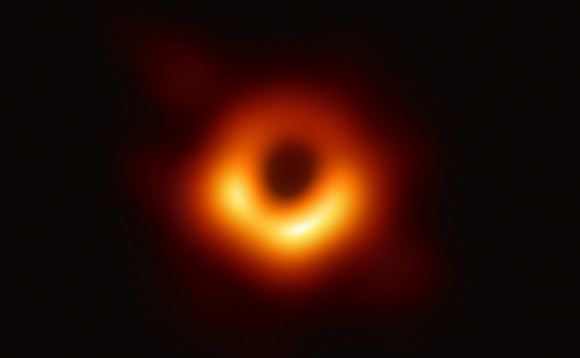 The first image of the black hole in M87. Credit Event Horizon Telescope/Katie Bouman*. The round spot in the center is not a shadow, but the event horizon itself. It is black because no light can escape it. The ring around it is the accretion disc of material spiraling in to the black hole. I believe the disc is close to perpendicular to our line of sight, but not close. The brightest part near the bottom is material that is approaching us, while the dimmer part above is material flowing away. There are many articles and a video of the news conference by pointing you favorite search engine to M87 black hole. About M87: More formally Messier 87, is a galaxy near the center of a vast cluster of galaxies about 55 million light years from us. Charles Messier found it in 1781 while searching for comets. He recorded it as object number 87 on his list of fuzzy objects that didn’t move and thus were not a comet. We amateur astronomers use his Messier Catalog to view these, what we call, deep sky objects. M87 is a giant elliptical galaxy that was also a radio source called Virgo A. The Wikipedia article Messier 87 has already been updated to include the results presented of earlier today. * Update: Dr. Katherine Bouman AKA Katie Bouman lead the team that created the algorithm that processed the data from the eight radio telescopes of the Event Horizon Telescope. Her ideas on how to perform this feat of mathematical and computer wizardry were presented in a TED Talk in 2016. Ephemeris for Wednesday, April 10th. Today the Sun will be up for 13 hours and 13 minutes, setting at 8:21, and it will rise tomorrow at 7:05. The Moon, 2 days before first quarter, will set at 2:04 tomorrow morning. Let’s look at the planets for this week. 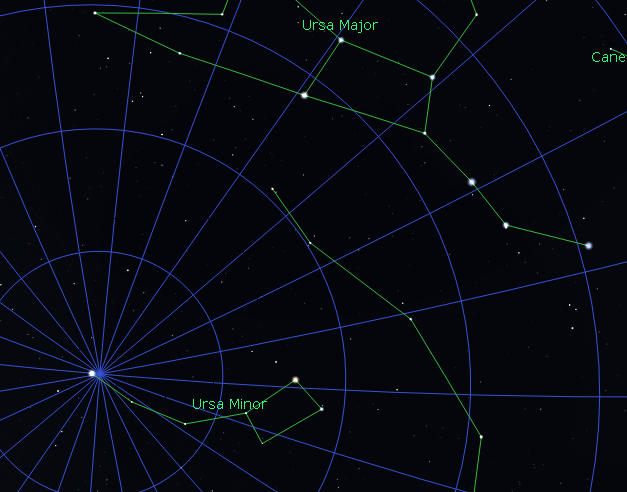 Mars will be in the western sky this evening, to the right of the V-shaped stars of the face of Taurus the bull. It will set at 12:27 a.m. In the morning sky we have Jupiter which will rise tomorrow at 1:35 a.m. in the east-southeast. It is second to Venus in brightness. Saturn will be next to rise at 3:21 a.m., also in the east-southeast. Venus will rise at 6:05 a.m. again in the east-southeast. By 6:30 in the morning they will be strung out from the southeast to the south. Venus will remain in our morning sky until August when it passes behind the Sun. Tiny Mercury may be glimpsed a bit left and just below Venus in the bright twilight. Mars and the Moon in the evening at 9:30 p.m. April 10, 2019. Click on the image to enlarge. Created using Stellarium. The Moon as it might appear in binoculars or a small telescope tonight at 9 p.m. April 10, 2019. Created using Stellarium. 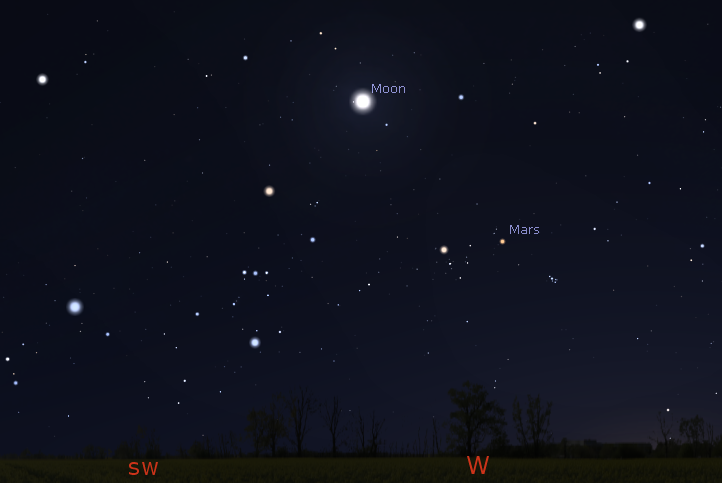 Morning planets at 6:30 a.m. April 11, 2019. Click on the image to enlarge. Created using Stellarium. Jupiter, Saturn and Venus with the same magnification at 6:30 a.m. tomorrow morning April 11, 2019. Created using Cartes du Ciel (Sky Charts). Planets and the Moon at sunset and sunrise of a single night starting with sunset on the right on April 10, 2019. The night ends on the left with sunrise on the 11th. Click on the image to enlarge. Created using my LookingUp program. Ephemeris for Tuesday, April 9th. Today the Sun will be up for 13 hours and 10 minutes, setting at 8:20, and it will rise tomorrow at 7:07. 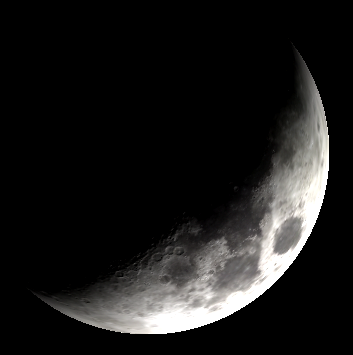 The Moon, 3 days before first quarter, will set at 1:00 tomorrow morning. There’s a great bit of excitement in astronomical circles for tomorrow’s release of an image of the event horizon of the supermassive black hole at the center of our Milky Way Galaxy, 27 thousand light years away. The black hole is designated Sagittarius A*. Pronounced Sagittarius A Star. Sagittarius is the constellation it’s located in, capital A for the first radio source found in that constellation and an asterisk, pronounced Star. 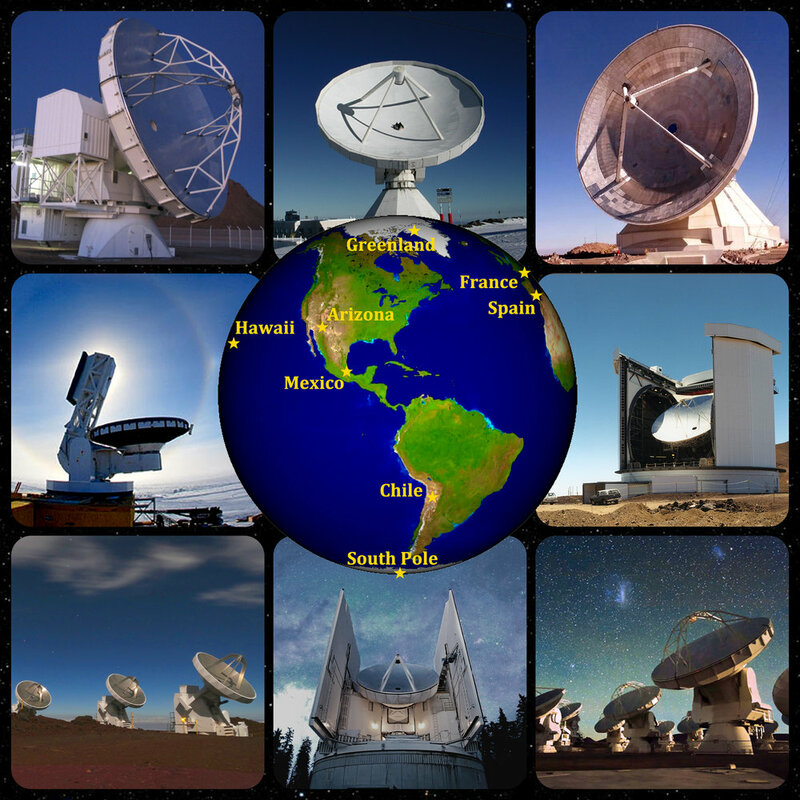 Eight highly accurate radio telescopes located from Greenland to the south pole, from Hawaii to Europe simultaneously record signals and record them to computer disks. The data are processed together to produce an image with the resolving power of a telescope the diameter of the Earth. The event horizon is smaller than our solar system. For more information see this news article from the AAAS Science Magazine: https://www.sciencemag.org/news/2019/04/here-s-what-scientists-think-black-hole-looks. For a non-technical explanation of black holes and the event horizon check this out: https://www.sciencealert.com/black-holes. Ephemeris for Monday, April 8th. Today the Sun will be up for 13 hours and 7 minutes, setting at 8:18, and it will rise tomorrow at 7:09. The Moon, 3 days past new, will set at 11:54 this evening. The most useful of the navigation stars for the average person is Polaris, the North Star or Pole Star. It is very close to the point in the sky that the Earth’s axis points to in the north. Currently it is about three-quarters of a degree from the pole, about one and a half moon diameters. In 2110 or thereabouts it will approach to slightly less than a moon diameter from the pole before slowly heading away. Polaris is always closer to true north than a magnetic compass in Michigan. To find it use the two stars in front of the Big Dipper’s bowl to point to it. This time of year the Big Dipper is above Polaris, so the pointer stars, that’s what they are called, point down to it. Polaris is at the end of the handle of the faint Little Dipper. The reason for Polaris’ motion is the slow 26,000 year wobbling of the Earth’s axis, called precession. Ursa Major and Minor, the Big and Little Dippers. See how the two stars at the front of the bowl point to Polaris. It happens that the pointer stars are close to the 11th hour of right ascension (longitude in the sky). The right ascension lines converge at the north celestial pole, just as the longitude lines converge at the Earth’s north pole. Created using Stellarium. The year I was born, 1941, Polaris was a whole degree from the celestial north pole. If you’ve ever wondered why right ascension is in hours instead of degrees it’s because the Earth rotates within the celestial sphere, so it’s easier to keep track of the east-west position in the sky by using a clock that set to gain 3 minutes and 56 seconds a day. Such a clock keeps sidereal (star) time rather than solar (sun) time. One hour equals 15 angular degrees or 4 minutes a degree. Ephemeris for Friday, April 5th. Today the Sun will be up for 12 hours and 58 minutes, setting at 8:15, and it will rise tomorrow at 7:14. The Moon is new today, and won’t be visible. Sneak peek at the Starpardy categories. For the Double Starpardy categories and the Final Starpardy answer, you’re going to have to come out.